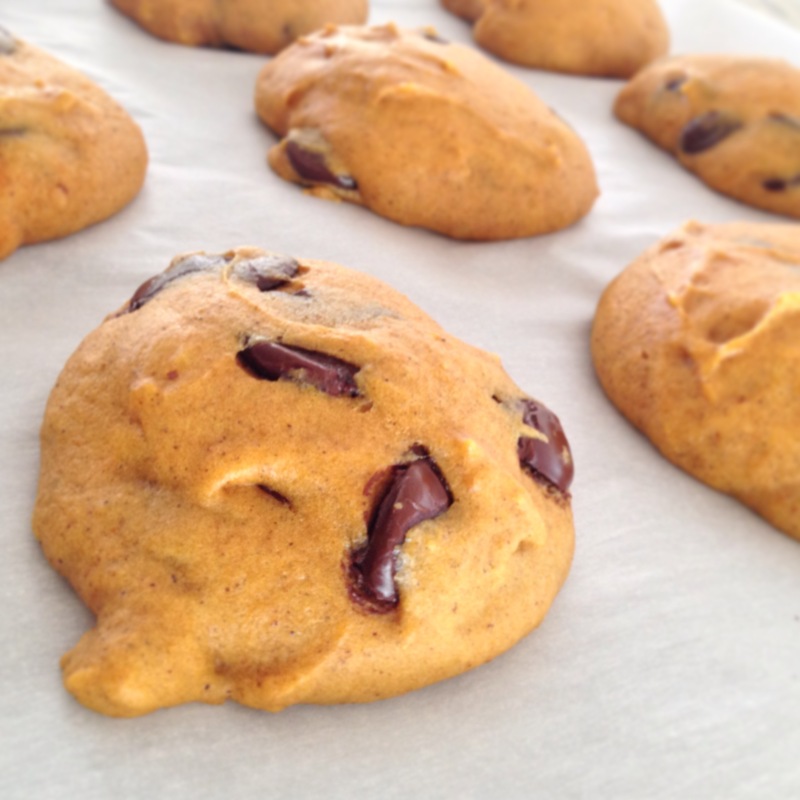 THE BEST DAMN PUN’KIN CHOCO-CHIP COOKIES. EVER. Pardon my ‘french’ but as the title suggests, they really are the best damn pumpkin spice, soft baked, sponge-cake-like, ooooey gooey chocolate chip havin’, GLUTEN-FREE cookies – EVER. I made a batch for a Friends-giving Potluck and all 20 of them were gone in no time. I have to admit I was a little bummed, only because I wanted one….but since I had eaten 4 just loading them up in their container for the trip I decided I’ll live. Then I vowed to share their heavenly health-in-a-cookie benefits immediately. 1.) First, combine the pumpkin, sugar, vegetable oil, and egg in a large bowl. In a separate bowl, stir together the flour, baking powder, ground cinnamon, nutmeg, and salt. Next, dissolve the baking soda with the milk and stir into the wet ingredients. Add the flour mixture to the pumpkin mixture and mix well for 1-2 minutes. 2.) Add the vanilla and chocolate chips and stir until combined. 3.) Line a baking sheet with parchment paper and drop cookies by the spoonful. Bake at 350 for 10-12 mins. Let them sit (if you can!) for at least 5 mins to cool before devouring them all….I mean, plating them for family and friends. And there you have it! Maybe you’ve heard of these….maybe you haven’t but either way your mouth will never forget them. ENJOY! Wanna make these gluten-free AND vegan? Hope over to Instructables. Don’t have the time or need to remove the gluten? Make these same cookies with just THREE ingredients with Shaken Together Life. Previous post SPICE UP YOUR LIFE!